Test cricket has returned. And it's about time. NWG had missed the whites and red balls (ok, what she really means is that she's missed Andrew Strauss). England started well. Better than expected. Strauss (a magnificant 123) and Cook (52) were actually scoring runs quite nicely. And then it went a but wrong. 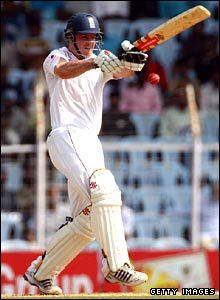 Bell (17), Pietersen (4) and Collingwood (9 - but wasn't out. Clearly a mistake) all came and went in quick succession, leaving Strauss and Flintoff (18*) to hold out till end of play. They didn't. But, the best news of all, and something that makes NWG feel all warm and fuzzy inside is that Jimmy Anderson (2*), not known for his batting prowess came in as Nightwatchman. Finally NWG feels at home. And he did her proud. Blocking here, there and everywhere, even scoring some runs (probably accidentally), but still a run is a run and at 229-5, they need every last one. Nightwatchmen are not to be underestimated. Part of a now dying breed (previously Matthew Hoggard had been Mr. Reliable, but is currently unceremoniously shunned from the England side), Anderson has taken up the challenge. And as he has 40+ Test appearances without a duck (impressive), he seems to be a sensible choice. NWG hopes that Jimmy will stick around and have a good go tomorrow. sadly he did not :( i was hoping for more from freddie too. its just so hard to be an english supporter.